Following the release of a collection of classics titled Wind[Re]Wind, Absolute Body Control is back with Shattered Illusion! Dirk Ivens and Eric van Wonterghem return with a whole new set of classic tracks, featuring modern sound recording techniques that blend seamlessly with the roots of low-fi electro. An absolute nod to the past, Shattered Illusion beautifully points to the early roots of electronic pop and industrial. 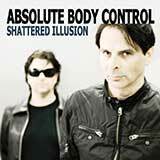 Absolute Body Control was formed in 1980, and the band members have been influencing and inventing genres ever since.